What is Tibial Tubercle Transfer? Tibial tubercle osteotomy is a surgical procedure that is performed along with other procedures to treat patellar instability, Patellofemoral pain and osteoarthritis. This is a safe procedure and provides excellent access and surgical exposure during a difficult primary or revision total knee arthroplasty. Surgical treatment is indicated when physical therapy and other nonsurgical methods have failed and there is history of multiple knee dislocations. Tibial tubercle transfer technique involves realignment of the tibial tubercle (a bump in the front of the shinbone) such that the knee cap (patella) traverses in the center of the femoral groove. The patellar maltracking is corrected by moving the tibial tubercle medially, towards the inside portion of the leg. This removes the load of f the painful portions of the knee cap and reduces the pain. Tibial tubercle osteotomy and transfer is done through an incision made in the front of your leg just below the patella. In osteotomy procedure, a periosteal incision of 8-10 cm length is made at a distance of 1cm medial to the tibial tubercle. With the help of an oscillating saw, a cut is made medial to the tuberosity and a distal cut is also made. 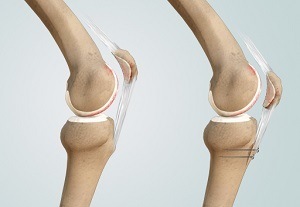 The tapered design of the distal cut avoids the risk of tibial fracture. Similarly, a proximal cut is made using appropriate instruments such as curved osteotome or reciprocating saw. Then an osteotomy through the bone cortex is performed without cutting of f the lateral periosteum. The lateral periosteum serves as a point of attachment for the osteotomy segment. By doing this, a tibial tubercle segment which is more than 2 cm in width, more than 1 cm in thickness and 8-10 cm length can be obtained. It should include all portions of insertion of the patellar tendon. The segment from the tibia is then levered using osteotome to provide access to the medullary canal of the tibia.